Engineers at the University of Colorado Boulder say they’ve created a new material that can work like an air conditioning system for structures. 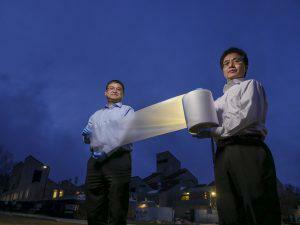 The material can cool down buildings in the hot sun with zero energy and water consumption. The material was developed from a $3 million grant awarded to the research team by US Department of Energy’s Advanced Research Projects Agency-Energy (ARPA-E) which invests in high-impact energy technologies. The research was published in the journal Science. Made of a glass-polymer hybrid under a layer of silver, the material piggybacks on passive radiation cooling which is how objects naturally shed heat without consuming energy. To cool a rooftop, for example, the super material is rolled across the surface then reflects the incoming solar energy back into space while at the same time, lets the surface purge its own heat. Because the material is about the same thickness as aluminum foil, it can be manufactured on rolls which would make it more adaptable and cost-effective for use in large-scale residential and commercial applications such as supplementary cooling for thermoelectric power plants. In a press release, Xiaobo Yin, co-director of the research and an assistant professor at CU Boulder’s Department of Mechanical Engineering said that by applying the material to the surface of a solar panel, you’d be able to cool the panel and recover an additional one to two percent of solar efficiency. The engineers are building a 200-square-meter cooling farm prototype in Boulder in 2017.